Innovative educators are constantly facing the challenge of matching pedagogical goals with complementary technological tools. Unfortunately, given the wide range of technologies and devices that vie for consumer attention, the right choices are not always clear. In this presentation, John Lester will describe how focusing on the way the human mind interacts with the world and other human beings can help identify the right tools for the right jobs. From a mind-augmentation perspective combining constructivist and behaviorist approaches, John will explore the “Art of Enhanced Reality” through tools for knowledge management, self-animated artificial life living in augmented reality, and the unique affordances of perceptually immersive multiuser 3d virtual worlds for collaborative learning. Below is a full video of my presentation, and you can find all my slides online. Thanks again for the opportunity! 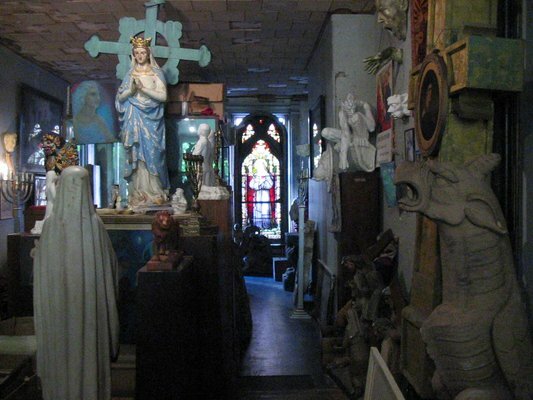 Part store and part museum, it was a mysterious space full of beautiful artwork, crumbling masonry and religious relics. Dry leaves that crunched underfoot were always scattered across the floor. And always in the background, a recording of a haunting piano melody played over and over. No beginning and no end. It was composed and performed by the owner of the store, Louis Gordon. Read on to get a free copy of the song. All of the items were for sale, but nothing had a price tag. If you inquired about purchasing an item, Lou would ask “What is it worth to you?” He also loved to talk with visitors about the history and background of all the artwork. Lou, the owner of “Gargoyles Grotesques & Chimeras,” in a PBS documentary about gargoyles back in 1999. Click to watch the video. While passing through Boston on my way to visit my family this holiday season, memories of this special place suddenly floated up in my mind. Sadly, I learned the store closed in 2008. 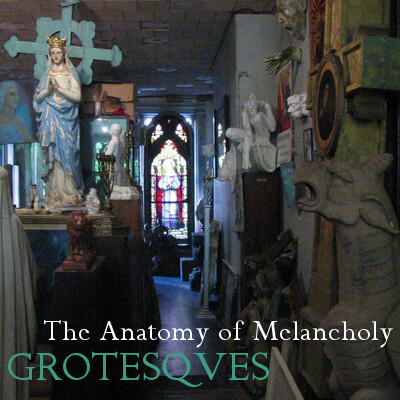 I found many wonderful reviews from other people who had also been deeply touched by this meditative place. It’s amazing to me how many people loved it. One of the artists featured in the store was Duncan Chrystal, who’s current work can be found online. 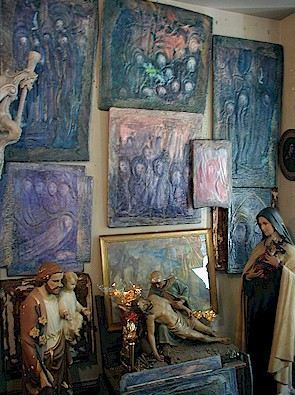 I bought a couple of his pieces for myself and my family over the years. When I returned home to Montreal, I dimly remembered buying a CD recording of that special piano music from Lou many years ago. I also remembered making an mp3 from the CD the same day I bought it so that I would never lose it (my physical CDs have a tendency to break or disappear). After some digging through my digital archives, I finally found the file last night. It’s a real relic from the past, with a file creation date of October 16, 2001. It is hard for me to believe it has been over a decade since I bought it. 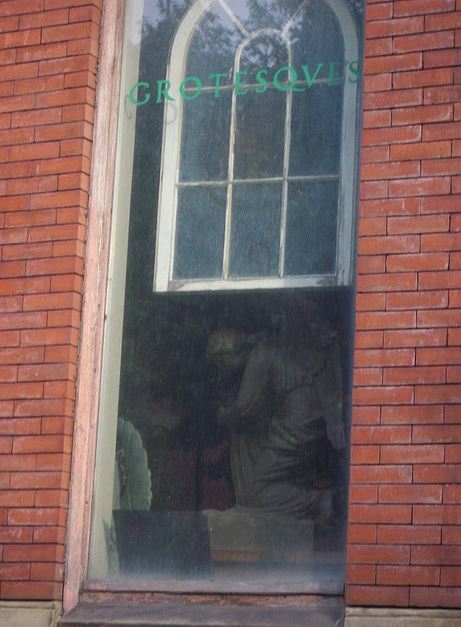 Gargoyles Grotesques & Chimeras is now only a memory and, sadly, I cannot find any current contact information for Lou . Since I can’t find his piano song available for purchase anywhere, and since I also know many people like myself would love to hear it again, I think Lou would be happy for me to share it freely. Lou, wherever you are, thank you for creating a sacred space and inviting so many of us to share it for so many years. You used to say “Only those who are meant to come in, come in.” Please know that all of us who did will never forget. P.S. (edited 2/3/2013) Here are some of my own favorite pieces that I acquired from the store. If you have any pictures of your own treasured items from Gargoyles, please share them in the comments if you wish. 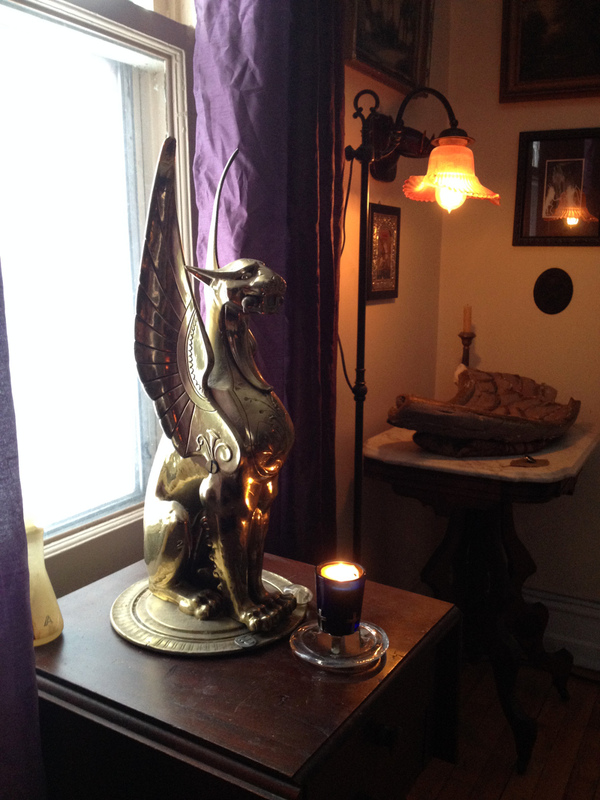 This brass winged lion used to sit on a column inside the store next to one of the front windows. 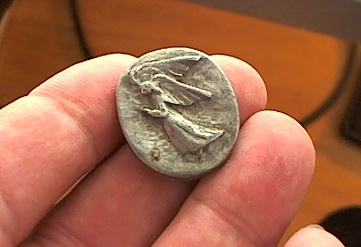 I used to have many of these pewter angel coins. This last one is tarnished and treasured. 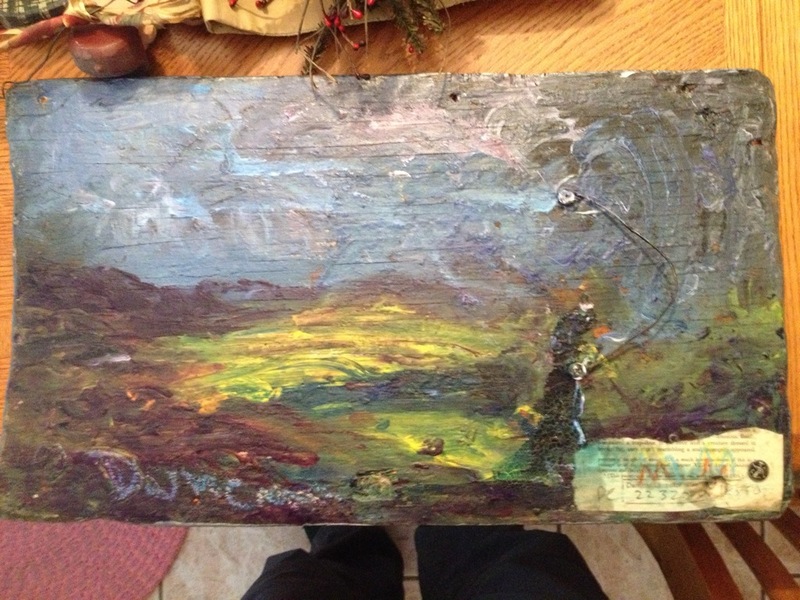 One of Duncan’s paintings that I bought for my mom many years ago. 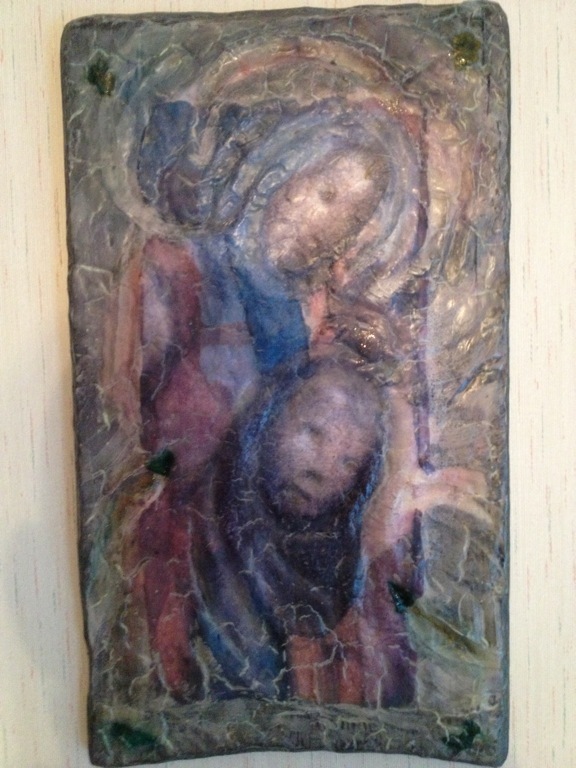 My mom was thrilled when she discovered the hidden painting on the back. I was listening to this today and noticed there was no cover art displayed my WinAmp player, so I made a very simple one. It makes me happier now to see the store while listening to the music. Please feel free to download and use it if you wish. 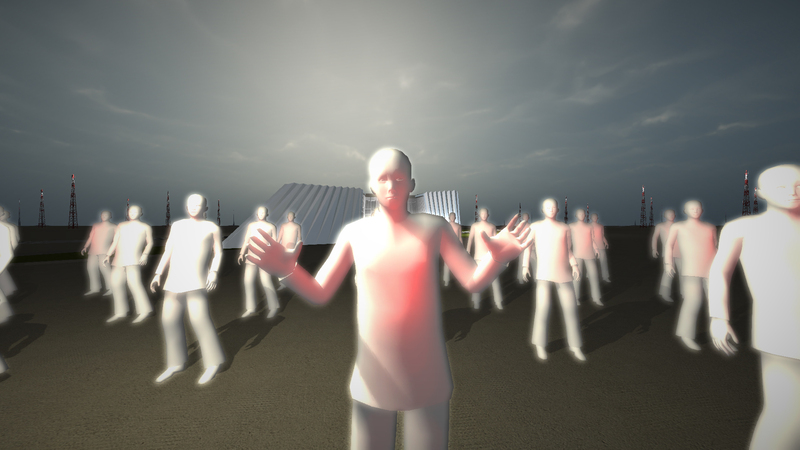 The Institute for Digital Intermedia Arts (IDIA) at Ball State University is a research and design studio exploring virtual reality, simulation, games and interactive interfaces. 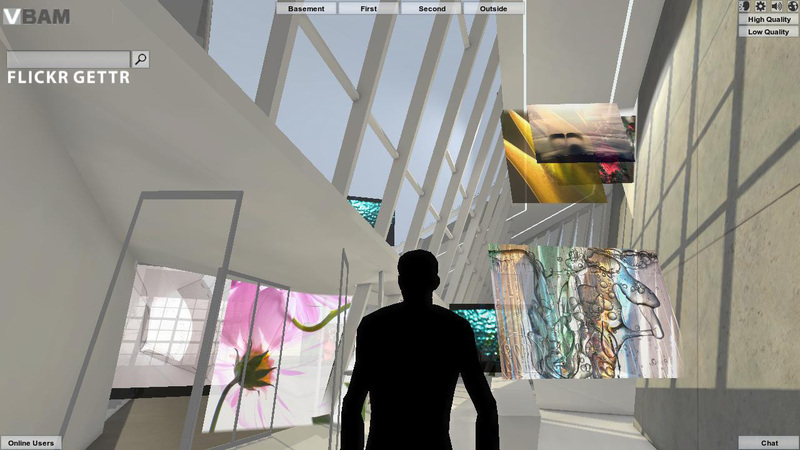 IDIA been commissioned to design and build a virtual presence and artworks for the upcoming Eli and Edythe Broad Art Museum at Michigan State University. And they’re building it with ReactionGrid’s Jibe platform! For more information, check out IDIA’s project website. On April 30th 1939 (that’s 72 years ago! ), over 200 thousand people gathered across an acre of land that only a couple years earlier was an ash dump. Thanks to four years of hard work and planning, those people were able to get a glimpse of the future. They were attending the opening of the 1939 New York World’s Fair. Paul M. Van Dort has organized a celebration of the Opening of the World’s Fair in ReactionGrid. This is the first time an event commemorating the Fair’s opening in a virtual world has ever been done. While only a few of the pavilions have been constructed so far, this is an opportunity to see the Fair and to actually walk around and explore it. Walk through the Trylon and Perisphere, view Democracity, and travel down the Helicline. Visit the New York City Building, the Belgium Pavilion, and Westinghouse Electric. And keep in mind that what you’re seeing is a vision of the future from 72 years ago. It’s pretty mindblowing to remember that fact. 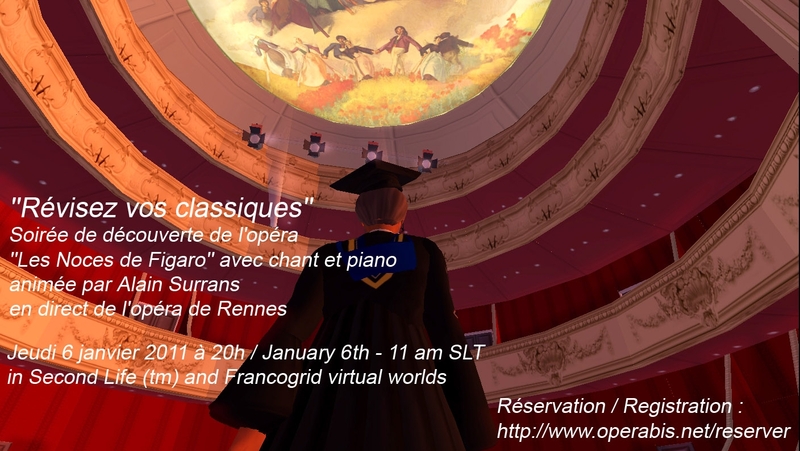 The folks on FrancoGrid are hosting another live opera. It’s happening Thursday, January 6 @ 8pm French Time (11am SLT/2pm Eastern). Our Hypergrid Adventurers Club attended the previous opera, which was simply brilliant. I’ll be leaving from the region Pathlandia on jokaydiaGRID at 7:30pm French Time (I want to arrive early) if folks would like a hypergrid guide to the performance. We can make the jumps from jokaydiaGRID to FrancoGrid together. 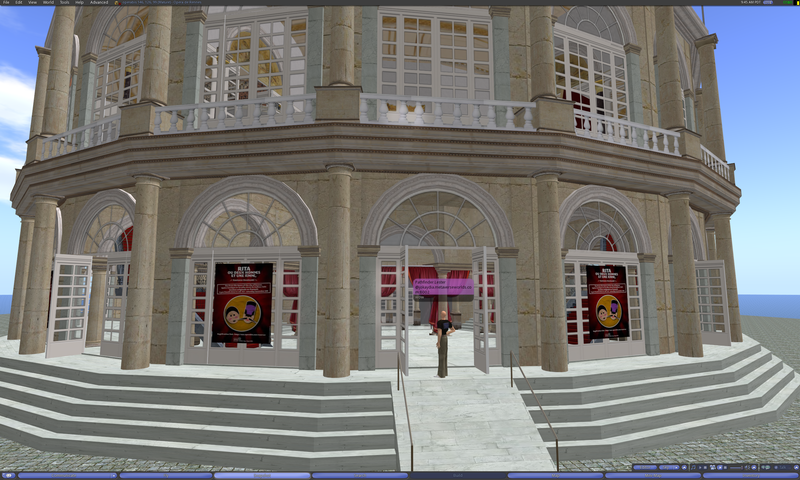 @Hugobiwan has created a poll to see how many folks will be attending the opera in Second Life versus Opensim. If you plan on attending the opera, please fill out this poll. That will help them a lot in their organizing and server setup. Thanks! UPDATE Jan 8, 2011: Some nice coverage of the opera in the French press. See these articles on France24 and leParisien, and video coverage by a French TV station. 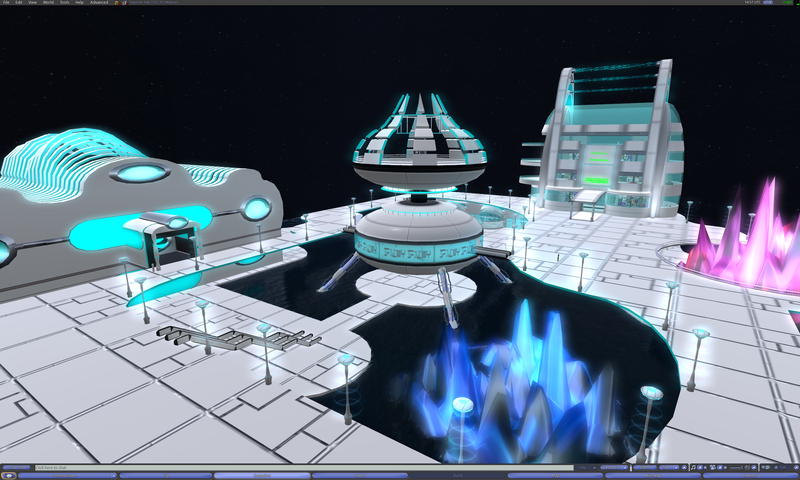 In today’s meeting we visited FrancoGrid and checked out a very cool science fiction themed region named Hybride. Hybride was stunning. It’s impressive to see how one can create a consistent visual theme across an entire region. We met some of locals of FrancoGrid, stopped by a great freebie store, and ended with an impromptu dance party. Read on for a full transcript and many photos. Today we took a Hypergrid jump tour from jokaydiaGRID to FrancoGrid. 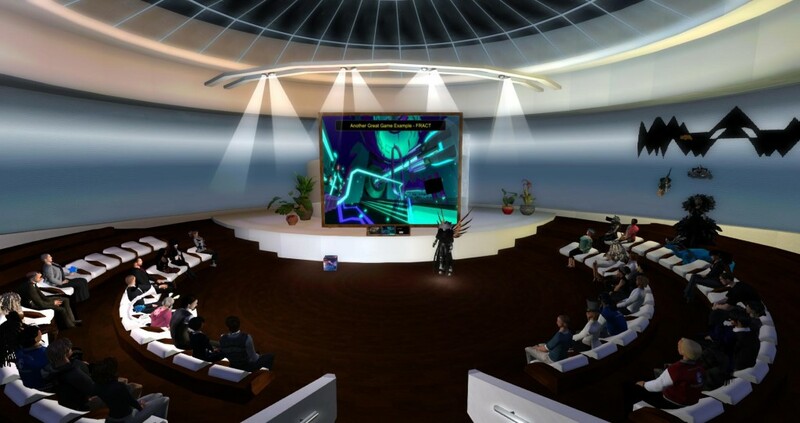 We attended an amazing mixed-reality live Opera on FrancoGrid. Read on for a full transcript and photos of this beautiful event. Today we took a Hypergrid jump from jokaydiaGRID to ReactionGrid. We visited PESD Island, a place where teens learn about history and art. It’s a great example of how to cultivate collaborative learning. Read on for a full transcript and photos of our journey! Pioneers are everywhere. And they explore many different worlds. We often find them in the worlds of business, science, technology and the arts. And we can learn many lessons by simply observing their innovative work. 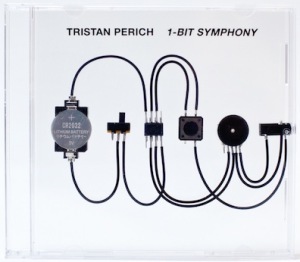 Let’s explore artist Tristan Perich’s recent work and see what it can teach us.